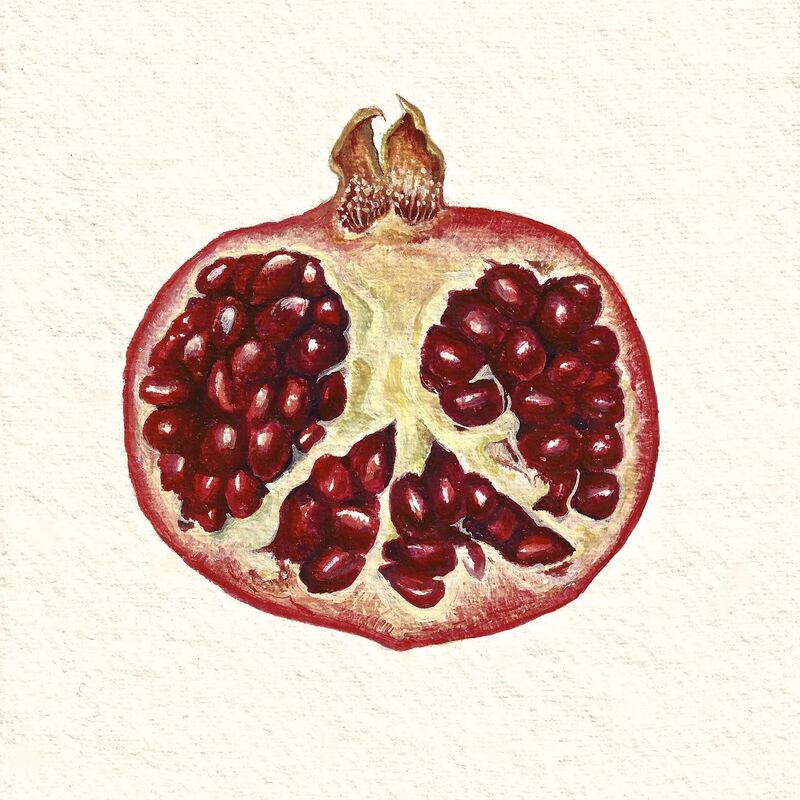 Listening to the Jackson Five, pinning down a skiddy, dry skinned cricket ball of a shell whilst jabbing at it with a teaspoon, is my first memory of a pomegranate. And to be honest, I thought it was messy and all rather pointless (not exactly as easy as ‘a b c‘.). So I put down the teaspoon and the stubborn fruit, wiped my hands on the front of my favourite nylon dress, and lifting the Dansette’s needle back to the beginning of the ’45 I trotted off miming the words “as simple as do re mi…” I wasn’t exactly charmed. In my mind I likened it to the same disappointment that the Two Bad Mice in Beatrix Potter must’ve felt, on discovering that all of the luscious and promising food in the dolls’ house was made of plaster: utterly duped. It was the age when ‘exotic’ fruits were beginning to appear at the local greengrocer, and mum perhaps felt more obliged rather than inspired to buy these strange fruit. Visually I was utterly beguiled… the treasure trove appeal was not lost on a 5 year old’s magpie-like penchant for shiny brightly coloured jewels. But the seeds were dry, bitter even. Give me tinned peaches any day… so little effort for a sweet and easy kick. And at the time we had rather a lot of tinned peaches as a result of Dad ‘finding’ a large quantity of industrial sized tins from a lorry that had slipped its load on a narrow bridge at night. We worked our way through the tins of the syrupy sweet slugs for weeks, and rather sadly I now can’t even look at them in the aisle at the supermarket. As a grown up their visual appeal never left me, but it seemed that no matter how many times I tried to find a liking for their flavour and texture, they would disappoint. I really couldn’t understand why you would want to eat them, let alone ruin a perfectly good salad with them! Yet the bizarre thing is that regardless of my lack of taste for them, I found myself constantly drawn to paint them. It was perhaps my way of compensating for that elusive element. Last year I visited a market in Barcelona, nothing spectularly life changing there you might think. But it was here that someone casually thrust into my hand a plastic cup brimming with pomegranate seeds, and so I tried them, one more time. The mouth explosion that occurred must be one that’s familiar to all those in ‘the know’. But for me it was a multi layered sensorial shock of the most undeniably sensuous kind. I was encouraged to spoon them into my mouth. But I somehow misplaced the spoon in my wanton, slightly untethered state of nirvana, and with eyes closed I ended up just simply pouring them into my mouth, red juice trickling as I bit and burst seemingly hundreds of these exquisite little ruby red grenades of flavour. There are many theories on the best technique to cut, peel, and empty the contents of a pomegranate, and I think that I’ve tried every which way possible, but by far the most satisfying way is this one… no spoon required either! 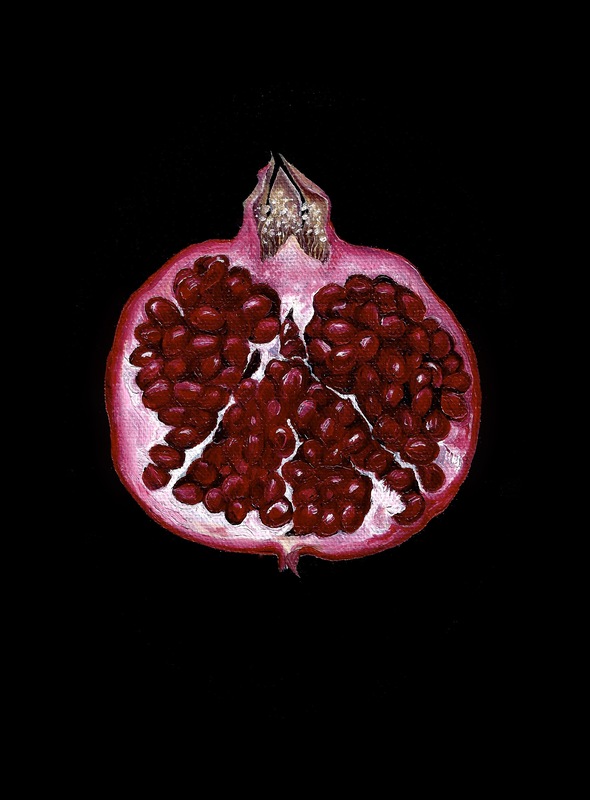 I shall never see a pomegranate the same way again. And I suspect I shall never paint them quite the same way either.